Another toy bought for Littlest Tot Tester for Christmas! Tomy are a very well known brand and I myself even had some of their toys when I was a child! 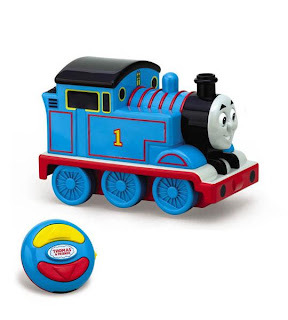 This is from their expansive Thomas the Tank engine range, and cost a reasonable 19.99 from their website. It has everything you'd expect- the face and detail of the character are instantly recognisable to anyone who has ever glanced at the TV show (yep another fave from my childhood many moons ago!). Is very chunky , but not overly heavy, which considering its size I thought it would be. It has 6 wheels which enable to toy to be pushed along quite easily. However, the toy also comes with a very simple remote control to move it forwards or backwards. The remote control is a nice shape and size for the age its aimed at (pre-schooler), and has only two large buttons on it- one for forwards and the other for backwards. When either is pressed, the main Thomas part makes a chugging noise, a steam noise, or toots. To begin with, Little Tot wasn't keen on it moving by itself! During Christmas day he preferred to push it along himself. It was Eldest Tot who is 16 months older who was most interested in the Remote control aspect of the toy, and she had great fun using the buttons to make it move and scare the life out of her brother! It is very basic, although you'd probably expect this from a toddler toy, I think it may not be a long term favorite as they get slightly older, but I do think once Little Tot gets over his fear of the r/c element he will enjoy it more. That's of course if Eldest Tot lets him have it back, she loves the thing! I'd say buy this for a 3 year old upto a 5 year old at a push.